It is anything but easy to tell the ‘untold story’ of a Bollywood star. Yasser Usman should know. A senior film journalist, he has recently penned an unauthorised biography of Sanjay Dutt, titled The Crazy Untold Story of Bollywood’s Bad Boy (published by Juggernaut) after penning the life sketches of veteran actors Rajesh Khanna and Rekha. The actor, however, seems less than impressed. Recently, he issued a statement saying, among other things, that the book was “partly based on my old interviews but rest all seemed to be based on hearsay, 1990s tabloids and gossip magazines”. In a conversation with Khaleej Times, Usman stands by the “extensive research” that informs his book and, of course, why Sanjay Dutt makes for a fascinating subject! How would you describe his relationship with his parents — actors Nargis and Sunil Dutt? Would it be incorrect to say Nargis’s death set off a chain of events in Sanjay Dutt’s life? You can say that. But bear in mind, by the time Nargis Dutt passed away, he was a chronic addict. Sunil Dutt was planning to launch him with Rocky, and while the shoot was going on, Nargis Dutt was diagnosed with cancer. Sunil Dutt left everything to be by her side. This was the time when everything went haywire. When Nargis Dutt passed away, he had no clue about the direction his life would take. One day, when Sanjay Dutt was sleeping, there was a servant who started crying. He asked him what was wrong, to which he replied, “Everyone has gone crazy because you have been sleeping for the past two days.” So, Sanjay Dutt says he looked into the mirror and thought, “I will die.” He walked up to Sunil Dutt and said, “Dad, I am going to die. Please save me.” That incident completely changed the father-son relationship. You can say it (the book) is a story of a father who refused to give up on his son, and a son who refused to grow up. He commanded a robust popularity despite the several ups and downs in life and fewer hits. What explains his mass appeal in the 1990s? 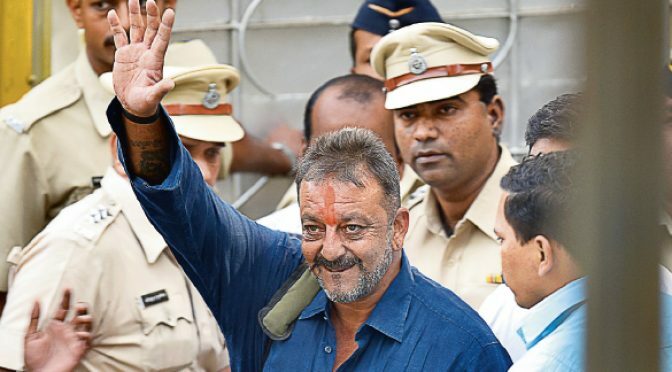 I met a senior police officer who just laughed and told me, “Just try to imagine, he is Sanjay Dutt, one of the biggest stars in India, son of Sunil Dutt, who was an elected MP from the ruling party then. Do you really think if he’d have called us, he wouldn’t get safety?” The second thing this officer told me was that when he procured the AK-56, he already had three licensed firearms. It is not as though he was as innocent as the film industry projected him to be. Then, how did the media narrative of the poor, little rich star take root? It was a different age. Today, actors are presented to the press in highly controlled environments. In Salman Khan’s case, his image was taking a serious beating in the media after the hit-and-run case. Then suddenly, the conversation turned towards his charity. In my opinion, it was a rebranding of his image. Sanjay Dutt was too naïve to do that. Whatever image he had, it came from him and the people around him. Whoever I met — his friends, school teachers, etc — maintain he has a heart of gold. Even after the 1993 Bombay blasts, people were like, he is too foolish to realise what he’s saying. When it was alleged that Sanjay Dutt knew beforehand that terrorists were planning to attack Bombay Stock Exchange, Shatrughan Sinha had remarked, “Don’t be ridiculous. He doesn’t even know what a stock exchange is.” It might be partly, but definitely not completely true. However, my book is not entirely about that. There’s also an element of chauvinism that he admits to. And yet most of his exes speak rather fondly of him. One cannot explain this. In his family, like most Indian families back in those days, it was a given that if you were working in the film industry, the women in your family wouldn’t. When Nargis got married to Sunil Dutt, she was the bigger star. But she gave up everything. Now look at Sanjay Dutt’s wife Richa Sharma’s background. She came from New York to pursue a career in films. Dev Anand launched her in his film. When she married Sanjay, he said she was not ambitious and, in any case, he wouldn’t want his wife to work in films. He added that if anyone wanted to call him a chauvinist for this, then they could. When his daughter Trishala wanted to join films, he said he wanted to break her legs. So, I don’t know how to explain this. Perhaps he’s a genuinely warm person. But he’s never denied his chauvinism. In one of your interviews you touch upon the transformation in his approach to his religious identity. Can you elaborate on that? You have to understand his background: when Sanjay Dutt was growing up in Bombay, Nargis was busy with her charity work, and Sunil Dutt was busy with his films. So, a substantial amount of time was spent at his grandparents’ place with Nargis’s mother and brother. Their house was in an area which was predominantly Muslim. His friends in the formative years were Muslims. He was close to that part of his identity. Secondly, they were not an orthodox family. He was a little tilted to his Muslim identity, or so I feel. Mahesh Bhatt told me that he would wear a taaveez (amulet). Politically, after the 1992 demolition of Babri Masjid, the world around us changed. Riots happened in two phases in Bombay. During those times, Shiv Sena, political rival of the Congress of which Sunil Dutt was an MP, began to create a narrative that alleged that Sunil Dutt was only helping Muslims. This was factually incorrect. I met so many people from his constituency who said this was propaganda. Then the 1993 blasts happened, this actually went against the family. There is an entire episode where Sunil Dutt, in a police station, asks his son, “Why did you do it?” Sanjay Dutt says, “I have Muslim blood in my veins.” Congress, it is said, deserted Sunil Dutt. Finally, with no help coming from any quarter, Sunil Dutt went to meet Balasaheb Thackeray (founder of Shiv Sena). He told him he wasn’t there as a member of any political party, but as a father. After that, Thackeray did everything to help him. Their mouthpiece Saamna called him a great patriot. When Sanjay finally came out on bail, there was a huge tilak on his forehead. He went straight to Siddhivinayak Temple in Mumbai. Of course, there’s no problem in going to the temple. But they were not so vocal about their religion before that. That’s how the political narrative also changed which affected the Dutt family. Sanjay Dutt has issued a strong statement challenging a few aspects of the book. What is your stance? If you read his post, he says he is hurt and hopes there are no more extracts published of the book. We in the Indian media pick the most dramatic extract and give it a sensational headline. If you read the book, it offers a complete picture. I stand by every line of the book because every statement is duly attributed. More than that, it is based purely on interviews he has given to magazines, and even me. My second biggest source is a book written by his sisters Namrata and Priya, Mr and Mrs Dutt. My third source: the filmmakers who have known him. When you set out to write an unauthorised biography, what is the process like? What are the challenges? The first step is to approach the subject. When I wrote the Rajesh Khanna book, I got in touch with his family. For Rekha’s book, I got a call from her secretary Farzana and we had a long chat. Finally, they said we don’t want to be part of it, but you go ahead and write about it gracefully. In Sanjay Dutt’s case, I sent messages to him and his sisters. Nobody responded. I met people around him, the co-stars and filmmakers. Magazine interviews are substantial part of my research because back in those days, if Sanjay Dutt or any star had to set the record straight, they wouldn’t call the newspapers; they’d get in touch with film magazines. I haven’t used gossip; I have used recorded interviews and quotes. In an unauthorised biography, the process is rather difficult: since your primary source is absent, you have to go through multiple secondary sources. You have to also be on a very strong footing legally. After I finish my manuscript, it goes to a lawyer — at least two of them read my books and tell me what can or cannot go. So, it has to be a factually strong book.